I’ve studied hope in Christian samples for several years and find it a powerful motivational dimension of human functioning. Level of hope predicts counseling outcomes. The contents of this book fit well with my view of couple counseling. Disclosure: I know both authors but I got my book from the Encounter Journal for purposes of writing a review. 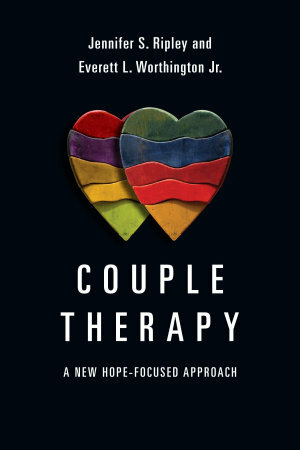 Couple Therapy is an approach to couple therapy grounded in the belief that a Christian’s faith in God leads to hope and that this combination of faith and hope can lead to loving relationships. The book is written for professional counselors, pastors, and lay counselors, but the authors also note that married couples may benefit from the principles and interventions covered in the thirty chapters. In contrast with other approaches that focus on relationship satisfaction, Ripley and Worthington focus on four goals: warmth, virtue, health, and happiness. In this view, couple counseling helps couples develop a warm and strong relationship characterized by virtues. In addition, a healthy relationship is characterized by respect and caring and couples need hope that they will find happiness in love. Ripley, J. S. & Worthington, E.L. Jr. (2014). 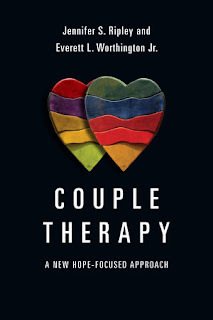 Couple therapy: A new hope-focused approach. Downers Grove, IL: InterVarsity.